For a country whose citizens were slowly starting to learn about each other, the late 1990s and early part of a new century were times of nervousness. The racial divides of the past were profoundly apparent — as much as they are today, certainly — and the journey into the unknown scary. Dance-floors and musical tastes were deeply divided: whites kids were only just cottoning on to hip-hop, the Blk Jks had not yet appeared on the scene. The colour of one’s skin placed you into a reductive musical box. Kwaito, a brash new sound emerging from black urban South Africa was swaggering through a landscape of uncertainty. Pushing a black pop-culture into the consciousness of a nation and redefining a generation looking for something other than “The Struggle”. Mandoza’s behemoth of a hit, Nkalakatha did something special. It hit number one on Five FM, a station until then, considered the domain of white pop-culture. It crossed the musical race-divide and brought township swagger to white suburban weddings. To suggest that the song was a racial salve for a wounded nation would be disingenuous. Musical cross-over would never have that transformative power. I learnt this at a Johnny Clegg concert in Durban in the early 2000s. The audience was mainly white, the jock-types who spent their Saturdays watching rugby matches at schools they previously attended. Clegg broke into one of his hits, Great Heart, or Asimbonanga, I cannot remember. One of the hulks around me turned to his mates in the dance-circle and shouted out: “Lets do the k****r dance”. They responded with drunken, clumsy attempts at the Ingoma. Music’s power is not in the answers it delivers, but in the questions it asks. There were no societal answers in Nkalakatha’s cross-over mainstream appeal. Only questions about what commonalities we, South Africans emerging from a racially divided past, shared and chose to celebrate. These questions were anathema to the “unity through diversity” project South Africa had chosen — a reconciliation project that chose to celebrate differences, rather than seek out commonalities, in its search of national project of unity. In July 2004, Mandoza had just recently married, kicked a much publicised cocaine habit and released a new CD. I interviewed him at the time for a piece in the Sunday Tribune. The piece remains relevant. It is about Mandoza. It is about contradictions. It is about our country. Mandoza rides the open air bus around Durban’s city centre, a curious mixture of boredom and enthusiasm. The music from his eponymous new album is blasting through the speakers and spilling out on to the streets filled with Saturday shoppers. When pockets of quizzical people recognise the kwaito superstar their faces break out into half-moon grins; they wave, shout, or extend their fingers and thumbs into the Hola Seven salute. Mostly, he responds eagerly, coaxing further reactions over the music. Yet, at times, he plays the untouchable star, engrossed in his cellphone, presumably texting and listening to an inordinate number of messages, oblivious to the loud music around him and almost dismissive of the hustle and bustle of the streets below. As if, maybe, he’s a bit too cool for all of this. He is a mixture of celebrity fronting and the professional playing to the crowds. It’s a manner seemingly in keeping with the man, as if to say for all his popular appeal and the cross-over juggernaut which was Nkalakatha, he has to maintain a semblance of aloofness. Later, in the stilted confines of the Hilton Hotel, this curious dichotomy expands further; the nouveau riche trappings of the township hood turned millionaire musician seems more a homage to his roots than anything else as he hungrily attacks a take-out of wings from Chicken Licken. Occasionally, Mandoza stops to answer a question and lick his fingers, one of which is carrying the heavy platinum testimony to his recent marriage to Mpho, who chews silently and sips tea at his side. It’s a very different setting from the squalid Zola section of Soweto where Mandoza (real name Mduduzi Tshabalala) grew up and where the prospects for young people are bleak, bleak enough to make the lure of the gangsters and easy money from crime enticing. At the age of 16 Mandoza was arrested for car theft, and he later spent time in Diepkloof Prison, or “Sun City” as it is know to the locals. With delicious irony he was later to become a spokesman for one of the KwaZulu-Natal Department of Transport’s road safety drives. There is still a lot of the Zola ghetto in his muscular 26-year-old body. Mandoza says he spends much of his free time chilling, watching cartoons with his two sons – Tokolo, 4, and Tumelo who is 4 months old – yet there is a palpable restlessness about the man, the energy of the street which, despite such bourgeois preoccupations as eating out in malls, is hard to wash off. But the kwaito artist admits to having matured in the past year. “You stay in the ghetto you become ghetto-fabulous with the status, money and what-what. You don’t change or see the bigger picture,” he says in that inimitable, gruff voice. Part of this growth process may be the new house in Randburg and his recent marriage, but it also includes the kicking of a much-publicised cocaine habit which he felt was alienating him from the people close to him – his family and then girlfriend, now wife. He spent three weeks in a rehab facility in Cape Town late last year to clean up a habit which he admits to having for about three years, and which, at one point, was costing about R2 000 a week. Mandoza feels the addiction has made him stronger. “The way I was born, I was born to experience things and learn from my experiences. I learnt about responsibility, that family is very important,” he says. “It was getting heavy, you know, I was getting sick and tired of the street life. This was when I wanted to fit back in with my family, but I couldn’t fit, you know, so I had to do something about it,” he says about the decision to enter rehab. This newfound maturity has also translated into his latest release, Mandoza, which contains the hit single Sgelekeqe and is a departure from his previous albums Godoba, 9115 Zola South and the Sama-winning Nkalakatha, on which he worked exclusively with producer Gabi le Roux. 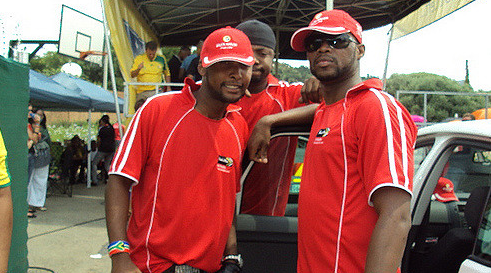 This time around the artist collaborated with several producers, including DJ Cleo and D-Rex. This move came, according to Mandoza, from a need for change and he feels “they make my album more ghetto in terms of the beats, it’s more kwaito, pure pure kwaito”. Mandoza, who started with the underground kwaito group Chiskop in the early 90s, ventured on a solo career in 1999 after the group had released albums like their debut, Klaimer, and Ghetto 2000. His music has always appealed to the body and the booty more than the mind and Mandoza is no different – infused with beats to get you moving and visceral lyrics, it is geared to have popular dance floor appeal. Whether it will charter the same territory that Nkalakatha did remains to be seen though. The title track from that album, which also garnered a Kora All Africa Award for Best Artist – Southern Africa, became the first post-apartheid South African mega-hit across all races and radio charts. It sat at No 1 on the traditionally white 5FM charts – the first kwaito song to do so – and perhaps its cross-over appeal was best encapsulated in Bloemfontein a few weeks ago.